My sweet husband got me a Wii for my birthday back in March and we LOVE it! Our little boy is only 21 months, so he's not old enough to play yet, but DH & I enjoy playing together tremendously and can't wait for the day when W is old enough to play with us! When using Wii Fit, we've learned that we need to put a lap board down on the ground to try and distract W from the Wii board, which he loves and always wants to sit or stand on...not very conducive to exercising! We have found that we watch less TV and are more active at night now, as most Wii games really encourage movement & activity. When I saw that Wii Fit was coming out, I was immediately intrigued. When you first get started with Wii Fit, you have to do a body assessment. You stand on the balance board and it captures your weight and also calculates your BMI. Wii Fit bases everything on your BMI - in fact, you never have to see your weight if you don't want to. It then puts up a BMI scale and tells you where you fall and then encourages you to set a goal to reduce your BMI. The amazing thing about the Wii balance board is that because it knows your weight, it can "sense" how you're standing on the board, where you're placing pressure, when you step on and off, etc. When you do either the strength or Yoga exercises, it will place a small circle on the screen, and then place a red dot in the middle of it. If you stay balanced and under control, the red dot stays in the circle...if you lurch all over the place, the red dot goes with you. This nifty little part of the program allows you to know when you're doing the exercises correctly and helps you improve your form. It truly keeps Wii Fit from just being gimmicky! Now on to the various activities - there are 4 different activity groups - Yoga, Strength Training, Aerobics & Balance. This is one thing that I especially love - there's something for everyone. Our family has a YMCA membership, but let's face it...some days neither of us make it. My husband's schedule is crazy and unpredictable, and their childcare hours are limited, and some days I just don't "feel" like it - but with Wii Fit, I can exercise whenever I want, when it's convenient for me. I can do 15 mins in the morning before my little guy gets up and then another 15 minutes when he's down for an afternoon nap or try to exercise with him standing next to me. There's a little piggy bank that tracks your fitness minutes each day and you unlock additional activities with the amount of time you spend. And as you spend more time, you unlock additional time or repetition options...for example, the super hula hoop starts out at 3 minutes, but as you become proficient at that time level, it unlocks a longer time setting. Pretty nifty! So if you already have a Wii - go for it! And if you don't - consider saving your $$ to get one. I know it's not cheap, but the family entertainment (and exercise) value is priceless in our book! 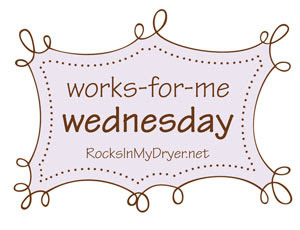 For other great WFMW ideas, head on over to Rocks in My Dryer!